Definition: Porter’s five forces model, refers to a framework based on the competitive analysis, introduced by Harvard Business School Prof. Michael E. Porter. The model determines the intensity of competition in any industry is a mix of five competitive factors operating in different areas of the whole market. The framework is an outside-in strategy tool for the business unit that evaluates the attractiveness (profitability) of an industry. Thus, helps the business-persons to identify existing and potential lines of business. It is a useful tool for accurately diagnosing important competitive elements in the market, as well as determining the strength and significance of each five forces. Threat of new entrants: Potential entrant is the major source of competition in the industry. The product range, quality, capacity, etc. brought by them, increases competition. The size of the new entrant plays a major role here, i.e. the bigger the entrant, the more intense is the competition. Moreover, the prices are slashed, and the overall profitability of existing players is also affected, by the new entry. It analyses the ease of entry to the new market, i.e. if the entry is easy, then the level of competition in the industry is severe. The number of suppliers in the industry is limited in number. They offer the specialised product. The supplier’s product is an important input, to the buyer’s product. The product has a few substitutes. Thus, the factor analyses bargaining power of industry suppliers, which directly affects the profitability, i.e. the higher the cost, the lesser is the profitability. Bargaining power of customers: The market of outputs, i.e. the customers have the ability to compete with the supplying industry and put the companies under pressure, by forming groups or cartels. This force not only affects the prices but also influences the producer’s cost and investments in certain circumstances, as the powerful buyers influence producers to offer better quality which involves cost and investment. Buyer groups are likely to exercise power if, they are concentrated, products are homogeneous, the switching cost is low, and full information is available. Threat from substitutes: It is the quiescent source of competition, present in the industry. They are the key cause of competition in many industries. Substitute products are offered at reasonable prices along with high quality, to the customers can radically change the competitive scenario of industry, especially, when the introduction is sudden. So, this factor analyses, how ruthless the competition is, by identifying the existing player and marketing down their moves and activities. The competition is said to be acute when, there are a few sellers, offering similar products to the customers because it is easy for buyers to switch to the one offering product at low prices. 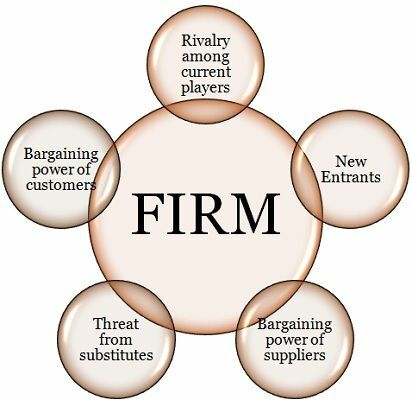 Therefore, the model is all about taking offensive and defensive actions, to create and maintain a competitive position in the market and to cope with the challenges (five forces) successfully.